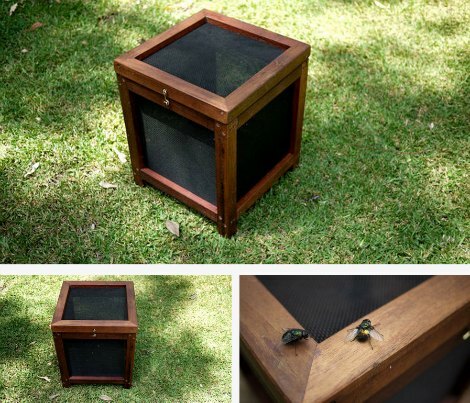 Simple methods can be used to trap flies that are common in most homes and in gardens. However, if you have a significant amount of flies at certain times of the year, then another option is needed. Getting rid of flies may be needed for important reasons. Flies can carry diseases and cause problems if you have garbage that is being left outside. One option is to build your own industrial fly trap. Reclaimed wood, scrap wood, or old wood around your home is the best material to use. However, you can also find the necessary materials for an industrial fly trap at a local home improvement store. The tools you need can also be found when looking for suitable wood. You will find tools at any hardware store. The most important detail about an industrial trap is attracting the flies to the trap. The basic concept of an industrial fly trap is keeping flies from escaping. The files that get trapped will not be able to access water and eventually will die. This will mean you can use to this to attract any flies found on your property. Your DIY fly trap will look like a small table when it has been completed. You will need to decide how you want to finish the exterior of your industrial fly trap. One option is to use paint or stain. If you are using cedar or other rot-resistant wood, then no finishing is necessary. Using any type of trap for flies means a suitable bait is required. Set up your industrial fly trap in an area where flies are a problem. You might need to check the trap for a few days to make sure it is working and there are no areas where flies can escape.